The Order of the Crown of Charlemagne was organized in the United States on January 1, 1939 and incorporated in the District of Columbia on October 10, 1939. It is an idependent patriotic and lineal society named in honor of the Emperor Charles the Great (742-814) and also named after an ancient noble and chivalric order in Europe which according to tradition was instituted by the Emperor in 802 to distinquish and honor his most valiant warriors who fought in the war against the heathen Saxons. Descendants of the Emperor have Maintained the order without great interruption through the centuries. The Order meets once a year in Washington, DC at a "black tie" dinner event the second Thursday of April. 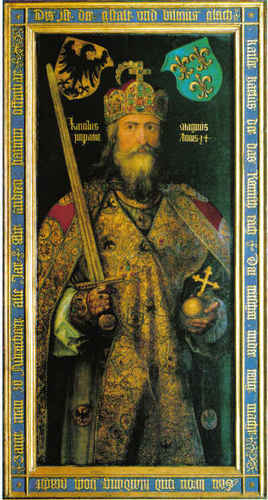 Historical and genealogical research and to perpetuate the memory and to honor the name of Emperor Charlemagne; to bring into one group the descendants of his successors and heirs; to maintain and promote the traditions of chivalry and knighthood; to recognize acts of merit; to recognize achievements in the Arts, Sciences and Letters; to inspire patriotism and loyalty to our country; and for such other lawful and proper purposes as the Executive Council of the order may from time to time decide upon. To collect and preserve books on genealogy, family history, heraldry and general history. To collect and preserve documents, manuscripts, relics, records and traditions relating to Emperor Charlemagne and his successors; to create a popular interest in ancient history and genealogy. The Order is non-political and non-sectarian.